The Greeks are a mathematical means of estimating the risk of stock options. Delta measures the change in the option price due to a change in the stock price, Gamma measures the change in the option delta due to a change in the stock price, Theta measures the change in the option price due to time passing, Vega measures the change in the option price due to volatility changing, and Rho measures the change in the option price due to a change in interest rates. In this article, I will demonstrate one way to access the Greek stats for any option using free online resources. 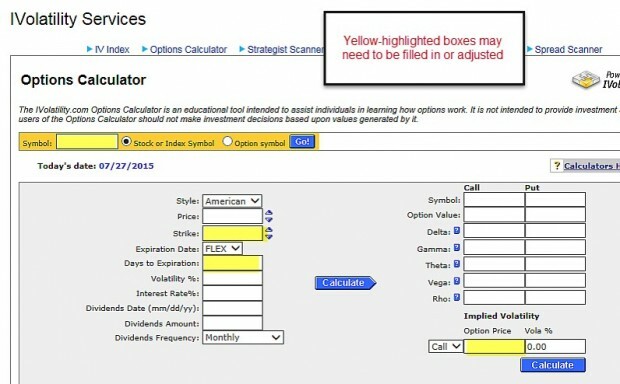 More specifically, in this segment I will use an options calculator provided by iVolatility.com, a company for which I write monthly journal articles (whenever I publish articles or commentary in other financial publications, the information is ALWAYS available on this site first). Notice that the Greeks changed as we used a different strike price and expiration date. Also, we entered an up-to-date option premium for the $95.00 call option which reflected an implied volatility of 46.35 compared to the 43.45 shown on the right side of the screenshot. 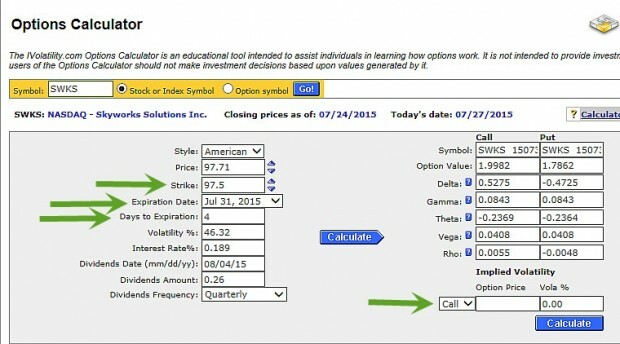 There are many available free online tools for calculating option pricing factors. The calculator provided by iVolatility.com is an outstanding example. 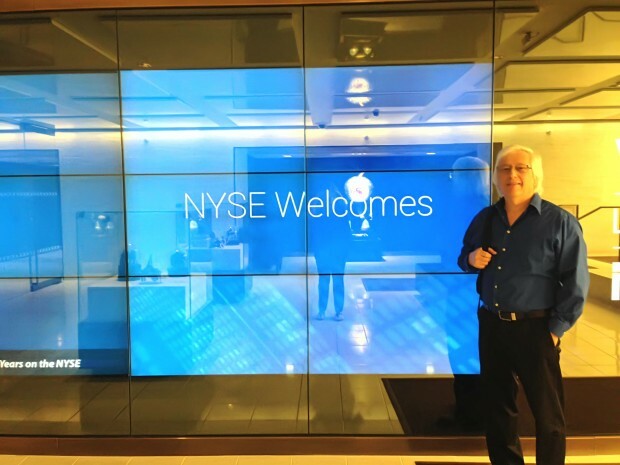 What’s this Blue Collar Investor doing at the New York Stock Exchange? As many of you know, the Department of Labor is proposing changes to the types of investments and charges by fiduciaries as related to sheltered accounts. The period for commenting to the DOL on these issues has ended and there has been considerable push back on the proposals especially from brokers and advisers. My sources feel that retail investors will not be impacted as it relates to covered call writing in IRAs although certain costs may be passed on to us. We are expecting to hear back from the Department of Labor some time in the spring. I will continue to update our members as I receive additional information. Second-quarter US gross domestic product growth was revised from 3.7% to a final annualized rate of 3.9%. Greater gains in consumer spending and commercial and residential construction fueled the upward revision. US sales of new single-family homes rose by 5.7% in August to an annual pace of 552,000, the highest level since 2008 and a much larger gain than expected. Sales were 21.6% higher than the previous year. For the week, the S&P 500 declined by 1.36%% for a year to date return of (-) 6.20%. BCI: This site remains long-term bullish on our economy but short-term concerned about recent volatility and extreme reaction to market forces. All call options sold for the October contracts are in-the-money and put options sold are deep out-of-the-money. Alan, thanks again and I may just turn to those low-volatility ETF’s if need be. 1. So for this strategy I am wondering how do these investors get through the ER’s?, do they buy put options maybe ATM or lower if not wanting to sellout? 2. Isn’t it perhaps better to use very large-cap stocks(APPL, FB, AMZN, etc)?, I am thinking they may be safer and less volatile – or would you disagree? 3. I am guessing this strategy is less time-consuming to use each week than your buy-write one, would you agree? 4. Also the question from John’ got me wanting to ask you an old one I still have. I once did a study program with a lot of DVD’s to watch, and there was a covered call DVD with the guy on it stating that we should save the first 6 months of profits, before then re-investing the amounts after that. He said he did this in case if there was a large market fall, where he says a stock would then need to have dropped between 12-24% (if making 2-4% /month for 6months), before he would start to make a loss. Do you not think this is a good plan to do when first just starting out, so to then have this cash reserve just in case a market correction were to come early on when starting off investing? I hope this isn’t all too much for you this week, but I will next need to email you some about the calculations and then a whole lot more after a little break. Thank you. 1- When portfolio overwriting, calls are written after the earnings report date or 2-month options are written so that the ER date is well before contract expiration. If Weeklys are available, the 4 weeks/year when reports are coming out, no Weeklys are written. 2- Large cap stocks in general are less volatile but the ones you mention are tech-related and can have significant whipsaws. A good way to meet your personal risk-tolerance level is to set a goal for initial returns. The premiums will reflect the implied volatility of the underlying securities. I use 2-4% per month in normal market conditions and 1-2% per month in my mother’s account. 3- Yes, definitely less time-consuming because you are not screening for new candidates and there is little or no portfolio turnover. The returns, however, will be lower but still significant. You must also be aware of ex-dividend dates as well. 4- I’ll get back to you on this one. We also must be alert for market declines and that’s why we must master position management before risking even one penny of our hard-earned money. I have a hard time allowing investment income sitting around not working for me. Having a cash reserve or a cash-equivalent aspect to our portfolio is a great idea but not in an option-selling account, in my view. Again, that’s my take that fits my personal risk tolerance profile. The Weekly Report for 09/25/15 has been uploaded to the Premium Member website and is available for download. In the article you define theta as based on calendar days, not trading days. If that’s the case when are weekend days calculated into option pricing? What a great question. Most market makers will calculate weekend days on Friday. It could be anytime during the day. Some even price in weekend theta on late Thursday. When markets open on Monday, weekend theta has already been priced in. Just wondering why your website (+ blog) font color is grey. Grey on white background is difficult to read. Is it possible to change the font color to black for better contrast? We enhance the “theme” of our site every few years and already have the ball rolling on the next generation enhancement scheduled for early 2016. A lot of work is put into these upgrades and my team has been preparing to make the transition an easy one for all concerned especially our members. Appears there are at least two “Jay’s” in the community. Certainly a fine name :). I appreciate the update above that you are back in the game selling ITM calls and deep OTM puts – bearish tactics for October expiry. I have been mostly in cash as explained last blog. Is there a near term signal you are watching for that might change your outlook? Certainly November and December seasonality is markedly stronger than the current period. Yet I have concerns about what the newly energized fringe element of the Republican Party might do to the market and the US credit rating in December. So I would be comfortable sitting out until what could be the “Mother of All Santa Claus Rallies” after that gets resolved! But on the Technical side the August SPX low was 1867 and if we bounce there it would be compelling to get a toe back in the water. I, too, have a defensive outlook but try to “stay in the game” almost all the time. My assessment is based on charts of the S&P 500, the VIX (recently dropped rom 40 to 25), the news of the day and weekly economic reports. Of these, the weekly economic reports have been the silver lining. My positions are entered and managed completely differently then had we been in a normal or bull market. Those of our members who are avoiding the market have completely understandable positions. I would encourage these members to paper-trade during this current market environment because if you can succeed now, you will succeed in nearly all market conditions. Although I was on the sidelines I was still studying your new book. Keeping the information fresh. Good stuff. But of course the best learning comes from applying the information. And your reminder has got me to do just that! Thanks! PS. Are you coming to Las Vegas in November? I thought I saw that somewhere once upon a time. So satisfying to know that I inspired you to take advantage of current market conditions and paper-trade. That would be an opportunity lost. I will be in Las Vegas (Bally’s Hotel) for the national AAII Conference from November 6th through November 8th and speaking on Sunday morning from 8:30 AM to 9:45 AM. We’ll be in the exhibit hall all three days. If you were planning to go, I’d love to meet you in person. That indeed would have been an opportunity lost. The more practice the better. Sounds great! I’ve marked the date. I plan on making it over there. I live under two hours from there in Southern Utah. It’s a much easier trip than going to the east coast. It will be the nice to meet the man behind the books, blog and the BCI method. I look forward to it. My presentation is Sunday morning from 8:30 to 9:45. Thanks for the always informative reply. And how you unfailingly take the time to write back to all contributors helping each of us readers by so doing. I recall your mention on many occasions in either the books or on this blog that you are fully stock invested in options accounts almost all the time. I believe you mentioned the last time you weren’t was 2008. Yet in my years with you I do not recall anything like your recent posts that you are holding long positions but not writing on them. That seemed counter-intuitive to one contributor who asked about it and you replied it was akin to an earnings report time and you do not write in highly volatile times. That made sense. I did not like the technical set up, the seasonality or the macro background so I went to mostly cash in recent months. That leaves the conundrum of when to start buying again? You hate to do it above where you sold, that defeats the strategy. And buying below where you sold only to see another leg down is a hollow “victory”. Nothing easy about market timing which is why the CFA profession advises against it! Thanks for your valuable feedback. Current market conditions should be challenged by seasoned investors only. All others should paper-trade using all the tools available. We have some members who have been using the inverse ETFs and doing quite well. Those new to option-selling or stock investing in general should follow Nate’s path and trade in a hypothetical account…what great experience at no cost! Jay, I’ll throw an idea out there about buying again. What about selling cashed secured puts OTM on the stocks you want to get your hands on? This way you aren’t buying at current price and if there is another leg down you get a little premium plus purchase the stock at the lower price. Not bad. Ok, after selling the put, What if the price starts going up and you think it will continue and you don’t want to miss the boat? Since the stock price has risen your put can be bought back at a lower price then go ahead and buy the shares you like . You get to keep the majority of the put premium and you feel more confident about entering the position because you have more confirmation of continued price appreciation. What if the price appreciates and you buy the put back and then buy the stock only to see it depreciate rapidly? Well that is part of the difficulty of market timing and good luck to you! Haha. 🙂 …. or you could rapidly sell a covered call. Thanks for the reply. I like your idea of using OTM cash secured puts to get back into the market in lieu of outright buys. My timing is not so good to fear missing a run up! And the stocks I buy and use for options writing are beta neutral big names with dividends I plan to hold and “portfolio over write”. What guides me more is my sense of the overall environment for stocks. I have been doing fine in the volatile period selling weekly credit spreads outside R2 or S2 Technical levels, closing and rolling out if needed. I’ll always do those as base income generation. I am on the fence too. If the markets are going up its a great time to buy because we are near the support level/double bottom. But on the other hand if markets break support…. Do you have a book or two to recommend on your credit spreads technique? Actually last night I was considering purchasing “The Monthly Income Machine” by Lee Finberg and it made me think of what you do. The price has me debating the purchase. Hi Alan, Haven’t commented in a while but just wanted to say there is a silver lining in all this turmoil. Perhaps some of your member would like to see a different perspective than selling deep ITM during market weakness. To preface my comments let me say that I generally own my positions because I like them. Therefore, I do alot of what is called ‘portfilio overwriting’. 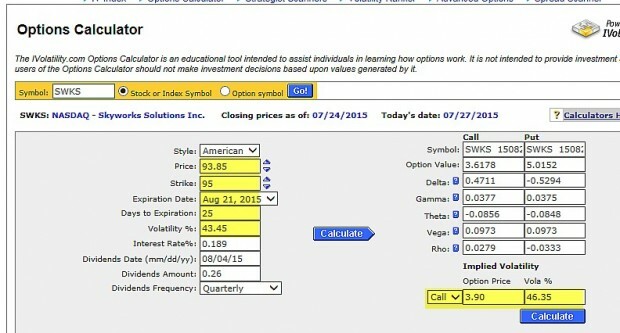 In the Sept Options month I purchased nothing new but sold Covered Calls on 15 existing positions. I sold far OTM with the expectation there would not be a quick bounce back. At Sept monthly Options expiration I was able to have 12 of the 15 positions expire worthless thereby keeping all my premium. Of the 3 that did not expire worthless, 2 were called and I bought back the other. Now this month (Oct) I again sold Covered Calls on 13 of the same 15 positions as last month. I also put ‘buy’ orders in on the 2 positions that I lost. They have since been repurchased at the price I lost them at and I have also sold Covered Calls on them. As you often say “There are many ways to make money in the stock market.” This is just another example. I see you are going deep ITM this month while I am going deep OTM. You have taught me alot this year, Alan. I may be losing money but I am certainly beating the market. Great to hear from you and thanks for sharing. Portfolio overwriting is an important and useful way of employing covered call writing for many of our members. Thanks for sharing and bringing this strategy to the forefront. This week’s 7-page report of top-performing ETFs and analysis of ALL Select Sector Components has been uploaded to your premium site. The report also lists Top-performing ETFs with Weekly options as well as the implied volatility of all eligible candidates. It is interesting that only one of the Select Sector SPDRs is in positive territory over the past three months and it is up significantly. Alan, thanks to your videos and books I understand the value of rolling down to mitigate losses when a stock is declining in value. 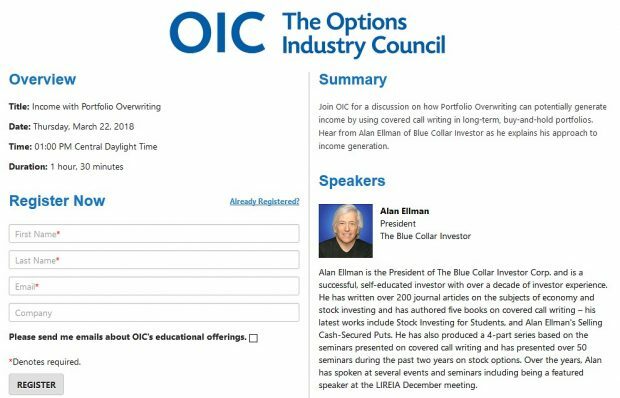 My question, what if there are NO OPTIONS that meets the BCI methodology criteria to roll down to; however, the stock continues to decline in value? For example, I purchased XYZ stock for $125 and sold the $120 ITM call for $8. XYZ stock declines to $115. I review the option chain for XYZ and there are NO AVAILABLE STRIKES where the BCI 10%/20% rule is met; or maybe the 10%/20% rule is met, however the available strike prices have insufficient open interest (less than 100) or the Bid/Ask spread is much greater than the BCI recommended $.30. Would you advise a mental stop loss to sell the stock at a certain % below the purchase price similar to IBD automatic 8% sell rule? If so, what would be your % loss you would allow a stock to decline before selling, assuming there is no strike to roll down to, or would you have some other advice? Thank you for your time and attention. 1- If you decide to roll down, there will be a time value premium that will lower your cost basis. So factor that into your decision. 2- Have a look at the performance of the stock in relationship to the overall market. I am more inclined to sell rather than roll down if under-performing. 3- We must always close the short options position before the long stock, if selling. One of our members who traded in hundreds of thousands of dollars has this unfortunate oversight and the rest of the story isn’t pretty. 4- A good range for a mental stop on the stock side is 8-10%. 5- One of the exit strategies I discuss in all my material is to close an entire position at anytime if news comes out of concern or if the stock is severely under-performing even if it doesn’t meet the BCI guidelines (although it usually will). I wondered whether there is anyone based in the UK and trading US options that has a good handle on how to file for Capital Gains Tax in the UK? Reading the information available on the internet or the Tax office in the UK – well there is hardly any information. The worst case scenario I have heard is that each transaction needs to be base lined at the equivalent pound value on the day of the sale – hence one needs to access the $/£ conversion rate (which is available – but that’s a lot of work). The other option I have heard is that one basically takes the value of the account at the start and end of the financial year and report the gain or loss as one transaction. Does anyone have a better view for the UK. Oh yes – hats off to this amazing source of information.